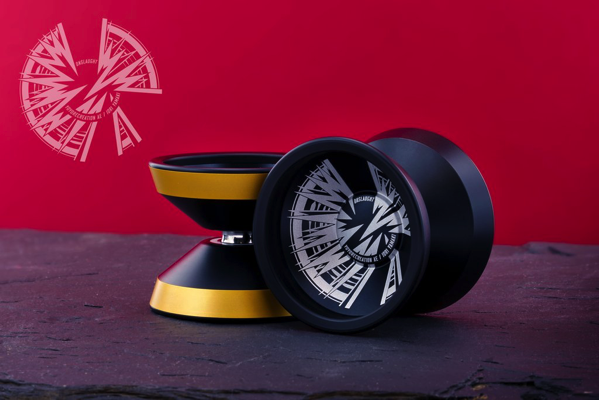 YoYoExpert Blog & Yo-Yo News – New Iori Yamaki Signature ONSLAUGHT! This latest release from Yoyorecreation is the signature model for Iori Yamaki. Iori is one of the most dynamic players in the competitive scene and he needs a yo-yo that can keep up with his speedy style of play – This is the Onslaught! The Onslaught was designed for players with a more aggressive and fast style like Iori Yamaki. It’s an aluminum/steel bi-metal yo-yo with a nice light feel and very powerful spin which lets it fly through combos as fast as you can push it. The wide stance combined with the wing shape profile makes the Onslaught practically all catch zone – Perfect for those impossible bangers and riskier elements on stage. By adopting a new rim structure that has not been seen in bi-metal yo-yos before, Yoyorecreation was able to achieve the optimal weight distribution while maximizing speed and power. If you’re looking for a new competition level yo-yo then look no further!